Cured meat is one of my favorite afternoon snacks. I think I would totally fit in on the streets of Spain where afternoon breaks for jamón ibérico are almost as commonplace as a kaffeeklatsch. So naturally, we just had to stop by yet another of Andrew Zimmern’s Bizarre Foods destinations: Salumeria Italiana, a quaint hole-in-the-wall specialty market known as Boston’s best Italian grocery. 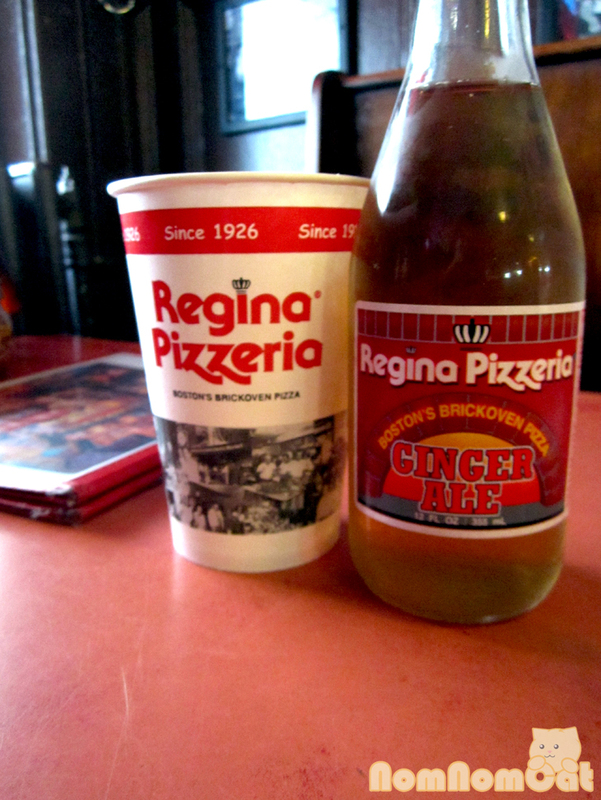 After our midday snack, we headed over to Regina Pizzeria, a brick oven pizza joint often voted Boston’s #1 Pizza. After yet another North End adventure, we wandered back to our hotel, full and oh so satisfied. As we stepped through the doorway at Salumeria Italiana, we were immediately greeted by a friendly older gentleman. The tall shelves of dried pasta packages, cans of San Marzano tomatoes, and bottles of oils and vinegar were amazing. 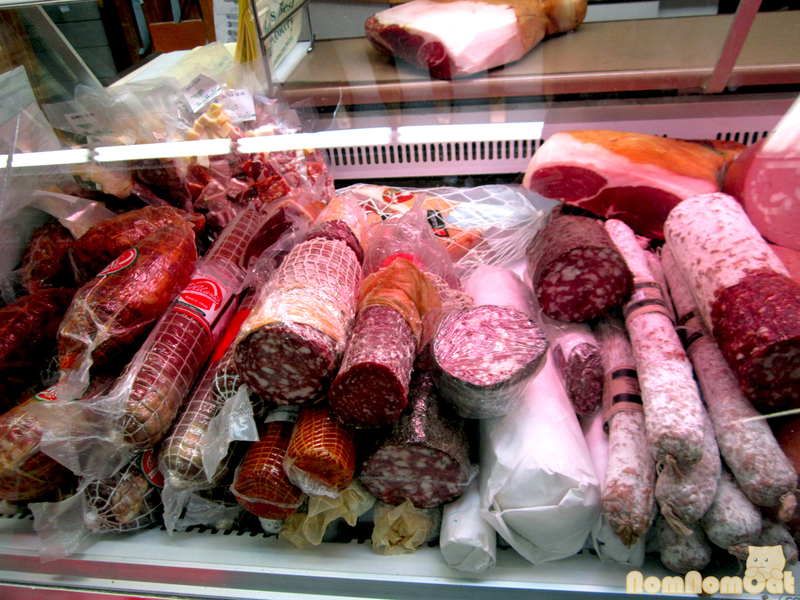 After the initial shock, we made our way over to the deli case of cured meats. We drooled, we pondered, and finally, we decided. One 1/4 lb, the shop minimum, each of prosciutto crudo di San Daniele (aged 16 months) and the coppa di testa. 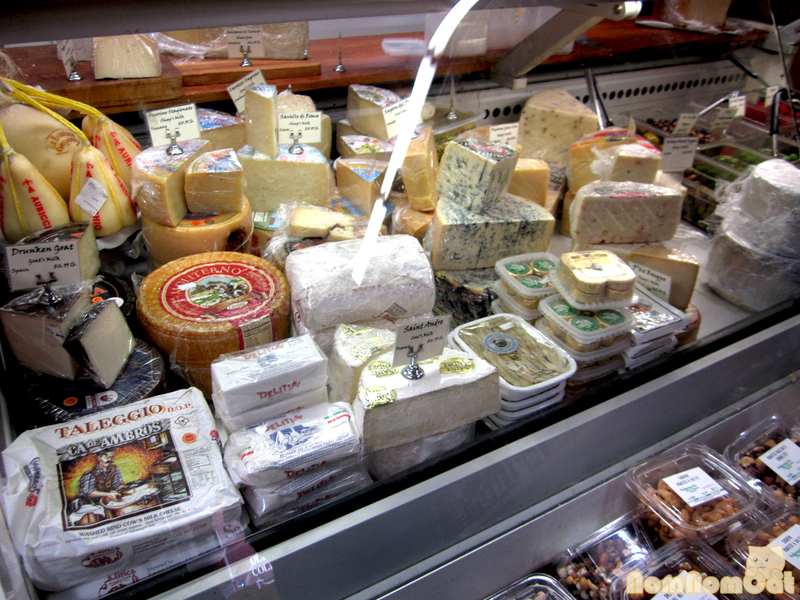 While waiting for our cured meats to be sliced and packaged, we browsed the impressive selection of cow’s milk, sheep’s milk, and goat’s milk cheese. The refrigerated case shares space with a wide variety of olives – green, black, and everything in between. We took our score over to the North End Park and enjoyed our meaty treats on a park bench. 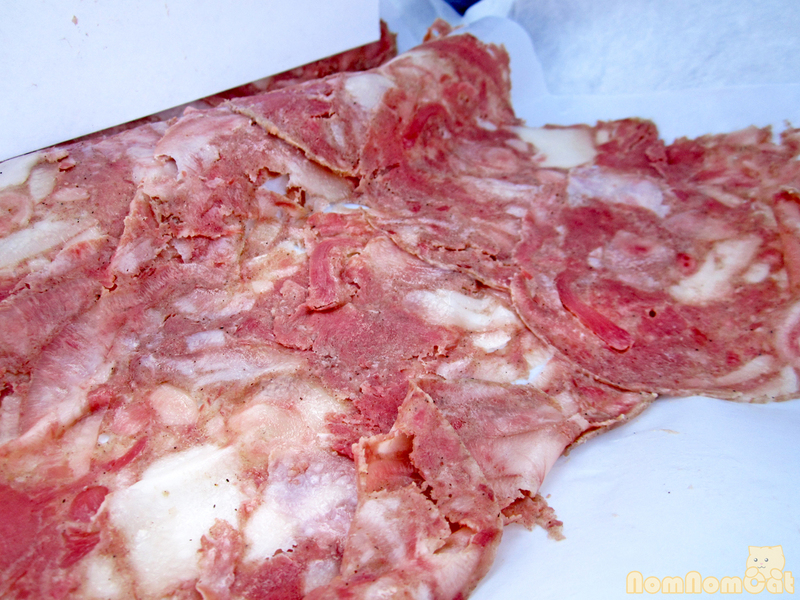 First up – the coppa di testa, a head cheese made with assorted pig face parts. The beautiful mosaic (as their website refers to it) consists of gelatinous bits of ear, tongue, cheek and other parts of the pig’s face… literally. But don’t be frightened off by the description. Each paper-thin slice melted in your fingers with the delicate fat and the varying texture meant that each bite was a new experience. Delicious! And of course, we had to get some prosciutto. They had a half dozen types, but we decided on this one. 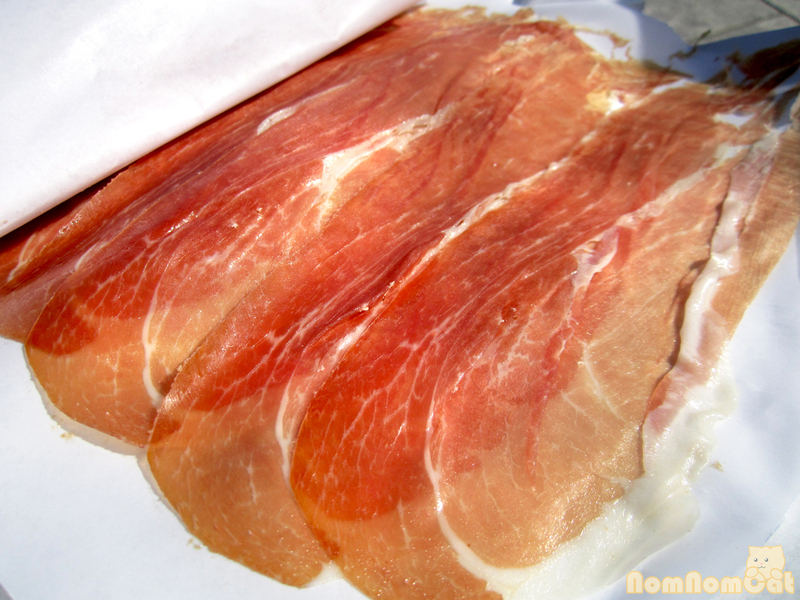 According to the website: The area of San Daniele has the ideal micro-climatic conditions for producing this Prosciutto, which has a pronounced aroma, and a sweet and delicate flavor. Smoky and sweet, this prosciutto was a winner. All I needed was a glass of wine and maybe a handful of cornichons to make the picture complete. Next stop – Regina Pizzeria. We went to the North End location, the original among over 20 locations today. We were warned on via foursquare tip of the terse interactions with our waitresses, so at least we were prepared for less-than-warm service. The food, we hear, is worth it. 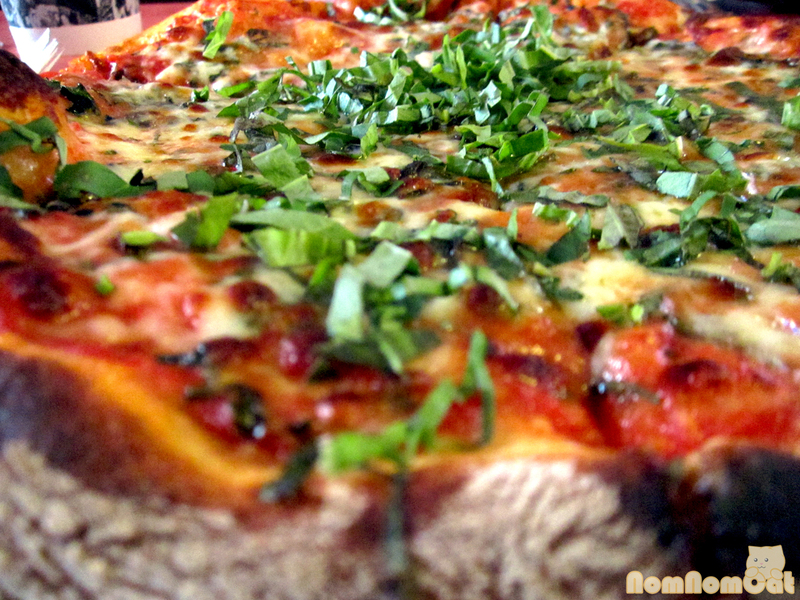 We shared a #10 – Margherita Pizza with fresh basil. The menu describes it as Something simple – Tomato sauce, fresh chopped basil with Mozzarella and Pecorino Romano. The beautiful bright green chiffonade basil, the light tomato sauce, the melty cheese, all on a crisp crust – this pizza was pretty darn incredible. The pizza arrived piping hot, the cheese melted in long strings, and the light amount of sauce meant that our toppings stayed on the slice instead of sliding off. At $18.99, the large is indeed large. We ended up taking a few slices with us in a box. The venue itself was decked out in bright red tables, wooden benches, and assembled pizza boxes piled high… the iconic pizzeria. The fountain sodas seem to flow endlessly. We could definitely see this as a great place to take the kids, celebrate a fun occasion, watch a game at the bar, or order takeout for a movie night at home. All 21 locations offer pickup or curbside service, and some of them even offer delivery to your door. At 4 stars over 600+ reviews, this North End location is doing the best on Yelp and we think you should check it out and taste it for yourself! 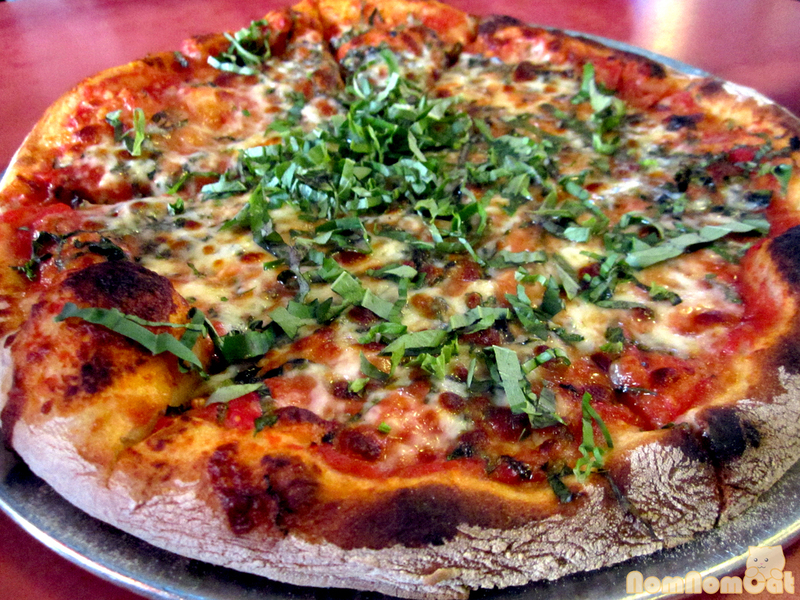 Burnt crust is truly the sign of absolutely fabulous pizza.